*Disclosure: IMHO Views, Reviews and Giveaways received An Amish Christmas Gift: Three Amish Novellas free in exchange for my honest review and was compensated with a gift certificate for my time. Nonetheless, you will always hear honest opinions that you can count on from me! This post may contain affiliate links. Enter for a chance to win An Amish Christmas Gift: Three Amish Novellas from Family Christian. Hosted by: Queen of Reviews Sponsor: Fox Home Entertainment Prize: Santa's Little Helper DVD After getting fired from his job, a slick, fast-talking businessman (The Miz) is thrown into an elf competition to become Santa¹s next second-in-command. Put through a series of rigorous training exercises to prepare for the contest, The Miz and another aspiring elf go head-to-head in the hopes of becoming Santa¹s Little Helper. Dates: 11/30-12/12 Open to: US Residents 18+ Enter to win using the widget below. Good luck! 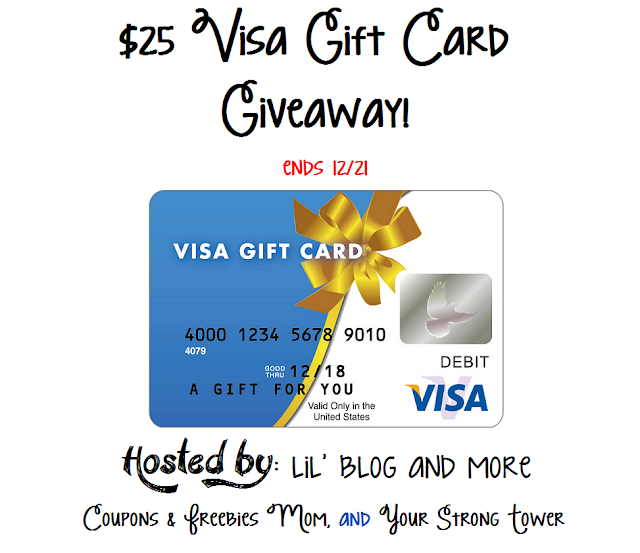 #Giveaway $25 Visa Gift Card Giveaway! Winner contacted me and is very excited that she won! Winners will be announced TOMORROW Monday the 23rd for the last Blog Hop Winner of my $25 Amazon Gift Card Giveaway! !